The iPhone doesn’t allow applications to control its camera shutter sound because of privacy issues – so LectureMonkey can’t turn off the click for you while recording. 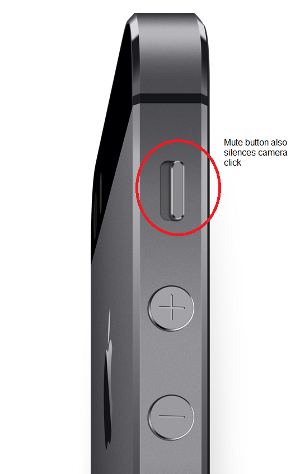 Luckily it easy for users to turn off the shutter sound themselves – just flick the iPhone mute button. LectureMonkey is a mobile and web platform that makes it easy to use an iPhone to capture lectures for later review. All lecture content (audio, whiteboards, and presentations) is easily and automatically captured – leaving you free to pay attention to the class. LectureMonkey is simple to use, just point the iPhone camera towards the front of the room and mark areas of interest like whiteboards and presentations and LectureMonkey does the rest. LectureMonkey automatically captures all important lecture content through images and audio. The captured lecture is stored on your phone and in your personal DropBox™ account. It is much smaller than video, and much more useful. You can enhance captured lectures by adding shared bookmarks and comments, and you can make lectures you captured available to your schoolmates to help them as well – and make yourself the class hero. Just think – review all your lectures anytime, anywhere! - Automatically record the whiteboard and presentation - Automatically record everything said in class - Audio only mode – record audio and manually capture presentation and whiteboard images or video - Easy review of captured lecture review saves you time when you need it most – right before a test - Skip directly to bookmarks and short reminders - Speed up playback by up to 50% – review a lecture in half the time To view a captured lecture, you can just use the built-in player; or just drag the DropBox directory on your computer to http://www.lecturemonkey.com to see the recorded lecture. This entry was posted in Blog, Recording Guide. Bookmark the permalink.